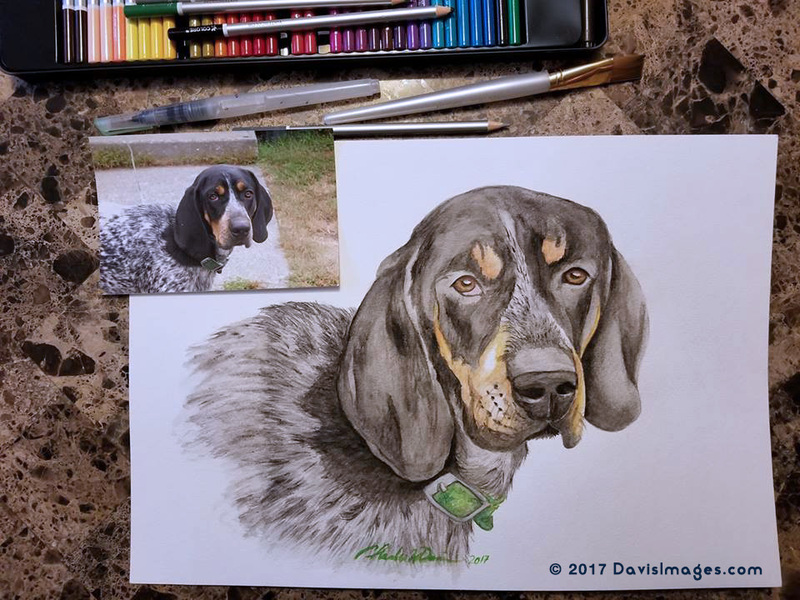 Interested in a custom animal or pet portrait? I celebrate pets of all shapes and sizes! Not only do I paint cats & dogs - I love painting domestic, wildlife, farm and exotic animals such as rabbits, horses, leopards, tigers, squirrels, chimps, hummingbirds, gecko lizards, teacup pigs, ponies, sugar gliders, beta fish, or parakeets/budgies! No animal is off limits for me to paint, it can be real, mythical, extinct, whatever. There’s a lot of time, love, and energy that goes into creating each custom piece! I want to help people and animals with my gift. I want to make people happy, give them a reason to smile, or be moved, and in some cases also to help heal and gain some closure from the loss of a pet. The second part is as it states, I am honoring the animals that I portray. In my mind I am giving each animal I Paint or Draw, whether they are with us still or not, a small piece of immortality. People will gaze upon them long after they are gone, and can still enjoy their beauty and personality. And finally I find peace in knowing that all of these positives will continue far into the future long after I myself am gone. Honor and Immortalize your Pet or favorite animal with an important piece of fine art; The Original Charles Davis Watercolor Painting. This work will continue to honor its subject, and elicit smiles and emotion for literally generations. I try to capture the unique personality of your “best friends” in a realistic style that can convey more emotion than a mere photograph! If you haven’t gotten a portrait of your pet done yet, it’s definitely a nice thing to consider. Having an artist-crafted dog portrait or cat portrait is a great way to celebrate the awesomeness that is your pet. It also can serve as a fond tool of remembrance for when you pet has passed away. Are you a small business in need of web or graphic design solutions? Do you need an Illustration? With each project I undertake, I work on a one-to-one, personalized basis with you, my client. No customer-service or sales representatives are involved--just the you and me. My clients are extremely important to me, and I strive to satisfy all their graphic design needs. DavisImages specializes in helping small businesses develop their professional advertising and marketing materials by offering graphic, web design, and illustration solutions at reasonable prices. A website is a cost-effective way to make your business accessible to your customers 24 hours a day, 7 days a week! A visit to your site can provide the information you want your customers to have, whenever they want it! A very convenient way to advertise...your information is always available and can be updated in an instant. By visiting your site, customers will know they are getting exactly what they want when doing business with you. You can free up some of your time by including frequently asked questions about your business. Are you a small business in need of graphic design services? DavisImages specializes in helping small businesses develop their professional marketing materials at reasonable prices by offering graphic design solutions for all your advertising and marketing needs. Certain projects are just screaming for a good illustration to get the message across. Whether your project requires a comical, playful, or serious design, I can help! As an artist, I can provide a unique vision to what I will do on your behalf. Digital Illustration offers the ability to communicate feelings and attitudes in an atmosphere using computer-generated digital images. I am highly experienced in all file formats and outputs of illustrations, including digital applications, print media, and digital broadcasting. A logo by definition is a graphic representation or symbol of a company name, trademark or brand. It is often uniquely designed for ready recognition. Your logo is the design or symbol that represents your company or organization. A well designed corporate logo signals the existence of a company, its strength, services and products offered. The aim is to create a lasting impression on a customer's mind. Every one of these steps is crucial to finish your project successfully. Here are the 3 Steps + to see all the steps in more detail. One of the most important steps in the design process is accumulating the information I’ll need. First, I'll work with you or your team to discuss your goals, identify your audiences, analys your brand, access your competition, and refine your market position. It’s now time to put my nose to the grindstone. After reviewing the materials given to me, I can start research. This phase usually entails taking into account competitors, market trends, product/service differentiators, the history of the business/client, and the future of it as well. Often best presented as a PDF file with the design in context. It’s now the job of you, the client to review the designs and provide feedback based on your objectives. Changes can be made as needed, final touches are agreed upon. Once approved, the finished piece will be implemented across all deliverables, which may include both print and web. Charlie is a team player who strives to accomplish any project he is tasked. He has a vast knowledge of the newest software to help him accomplish his work, whether it be creative design applications or Web. He once created a video of our department to teach people of our capabilities. This was a big hit, as we work virtually with many of our customers and it helped them to know who we were and what we could help our customers with. Charlie is a terrific design guy! What makes him terrific you ask? As a senior manager in a large sales organization, I went to Charlie for help in developing a multi-media presentation, suitable for multiple levels of the organization, capable of helping make an impact and most of all -- memorable. Charlie grasped the strategic issues I was pushing, the tactical way it needed to be delivered, and the technical requirements to get it done. One stop shopping -- I love it! By subscribing to our mailing list you will always be update with the latest news and tips from us.